I've been meaning to write about chocolate bark for a little while now. It's really a fun, and easy dessert to make and you can switch it up with so many different things. I especially like using fleur de sel because it really brings out the flavor of the chocolate. I was reading one of Ina Garten's cookbooks the other day and I couldn't agree more with her view on how to use different flavors when coming up with recipes. Ina chosses what flavor to add to roast chicken by figuring out what ingredients really boosts the chicken flavor. I think it's the same with the use of salt in certain sweet recipes. It's not so much that you taste a lovely contrast between salty and sweet flavors (although you do) but mostly that the salt helps brings out the complex flavor of good dark chocolate and make it taste that much more chocolatey and intense. This is the kind of recipe where the type of chocolate you use really makes all the difference. There are so few ingredients, that a mediocre chocolate can render the dessert rather bland whereas a good chocolate will make you go for seconds.. and thirds. Chop the chocolates into small pieces and place to melt in a double boiler. Once the chocolate has melted, remove from the heat and fold in the ¼ teaspoon of fleur de sel. Coarsely chop the roasted hazelnuts and fold half of them into the chocolate mixture. Line a small baking sheet with parchment paper. Gently pour the chocolate mixture onto the paper to form ¼ inch thick rectangle. Top the chocolate with the rest of the hazelnuts and the almonds. Add a small pinch of fleur de sel over the surface of the chocolate. Let the chocolate harden on the kitchen counter (about 2 hours). Once the chocolate has completely hardened, place it on a chopping board using the parchment paper, and cut into small triangles. This is fabulous and a drop dead gorgeous photo too. I've never made chocolate bark but I would love to. And wow...it includes Fleur de Sel. I've got to try this. Now this is chocolate. Nice! That looks so very good, and with the holidays coming what a perfect gift! 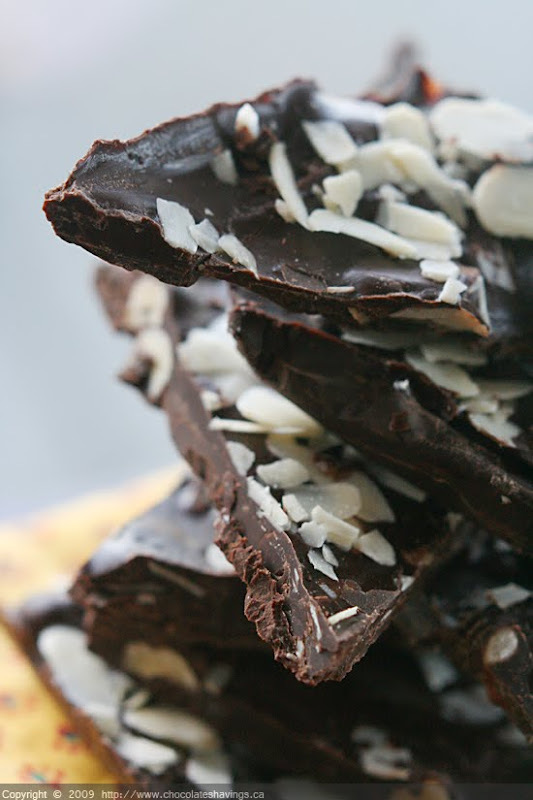 Great idea to use fleur de syl in your chocolate bark! Where do you buy fleur de syl? How expensive is it? That is such a great hostess gift idea (or holiday basket). I love giving people things like that. I totally agree with the salt in chocolate thing. If it's too sweet, all you taste is sweet. A bit of salt allows you to taste the chocolate more. Hillary: Fleur de sel is found in most specialty stores today. It's usually about 7 dollars for about 125 g.
Q: Ina made a fleur de sel chocolate bark recipe? I actually spent the weekend coming out with different chocolate bark combos and fleur de sel and hazelnuts was my favorite. This looks unbelievably good. What brand of chocolate do you recommend using? Thanks! Oh, I'm liking the looks of this! I couldn't agree with you more, in that high quality ingredients make or break a dish. From good chocolate to fresh farmers market produce to even sea salt, your dish is only as good as your components. This looks fantastic. I'm definitely going to give this a try. I've been looking for a bark recipe with a bit of a twist. This sounds wonderful. I love chocolate and hazelnut. Chocolate and salt might be my new favorite combo! I'm going to have to try this for sure. Beautifully written post; this would make a lovely gift...I can't imagine chocolate, hazelnuts, and fleur de sel, together at last. Perfect. Wow! The addition of fleur de Sel is fabulous! Lovely. You can't go wrong with that combination. What a great recipe! And a super photo. We always have a container of fleur de sel in the kitchen... we use it to top a lot of things. Most sweets (chocolate esp.) taste wonderful with a dash of fleur de del. It's worth the splurge. this looks and sounds great! I love chocolate with a bit of saltiness but my hubs hates it. I love how this looks! Gorgeous! I love fleur de sel too and always try to have a little box of it in my kitchen! Oh my, oh my. I love, love, love salt and chocolate...this looks amazing! This I will have to make! two of my fave things - YAY!! thanks for the great, great recipe. we'll make this soon!